The SMARTlab Show & Tell Seminar Series is a programme of social events hosted by the SMARTlab at UCD. In a relaxed environment, each event aims to share the breadth of knowledge and expertise of SMARTlab’s world-class researchers, artists, scholars, technologists and policy makers. The international team shares a commitment to creative technology innovation for positive social change with a ‘universal design’ ethos. The team works in collaboration with specialists in e-business and designing for sustainable development, social changes and community well being. SMARTlab comprises live artists, performers, dance and movement specialists, visual artists, filmmakers, photographers, sculptors, textile experts, fashion designers, poets/writers, composers/musicians, sound artists, VR engineers, programmers, game designers and coders, and interface designers. on ‘Technology-enhanced Learning: Key Research Challenges’. 17-26 July 2009 PhD Seminar – No Show & Tell seminar! August 2009 Holiday month – No Show & Tell seminar! 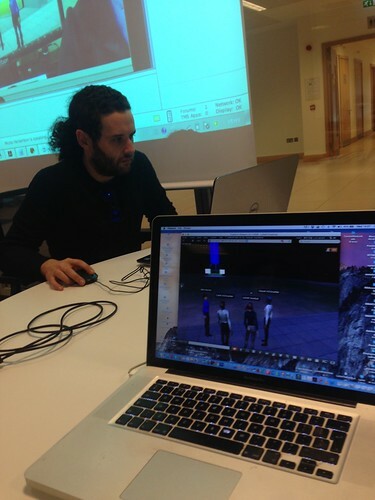 Dr Deveril on ‘Video making as a learning tool: towards simplification and accessibility’. 16-25 October 2009 PhD Seminar – No Show & Tell seminar! In this podcast Rebecca O’Brien is joined by Professor Lizbeth Goodman who is Professor of Creative Technology Innovation, Director of SMARTlab Digital Media Institute1 & MAGIC (Multimedia and Games Innovation Centre) at the University of East London and also Director of FutureLab2. Professor Goodman will be giving one of the keynote speeches at the JISC 2009 Conference3 in Edinburgh. Inter.ACT: Prof Lizbeth Goodman, founder of the SMARTlab Digital Media Institute with some provocative ideas on how a small amount of our time could be used to make a real difference through the virtual world.